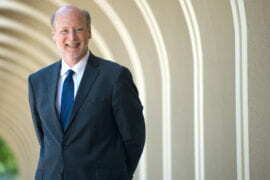 It’s mid-June, and Howard Gillman is four days into his tenure as UC Irvine’s new provost and executive vice chancellor. The walls of his office on Aldrich Hall’s fifth floor are bare. More tellingly, so are the bookshelves. For a scholar who professes that books – after family and work – are what keep him anchored, the waiting shelves signal that he has set sail on a new adventure. Expect him to waste no time settling in alongside his tomes of political science, history, law and philosophy. Named in May to his position at UC Irvine, Gillman says he’s excited to be joining the Anteater community. The former dean of USC’s David & Dana Dornsife College of Letters, Arts & Sciences will assume primary responsibility for academic and organizational functions, as well as for advancing the university’s excellence in education, research and public service. He will also hold an appointment as a professor of political science and law. While he considers listening one of his strengths, he has a few ideas of his own about how to elevate UC Irvine to even higher levels of greatness. Its status as a young, world-class university – named top in the nation in the “100 Under 50” ranking by Times Higher Education in June – gives him much to work with in what he calls an era of rapid and disruptive change. 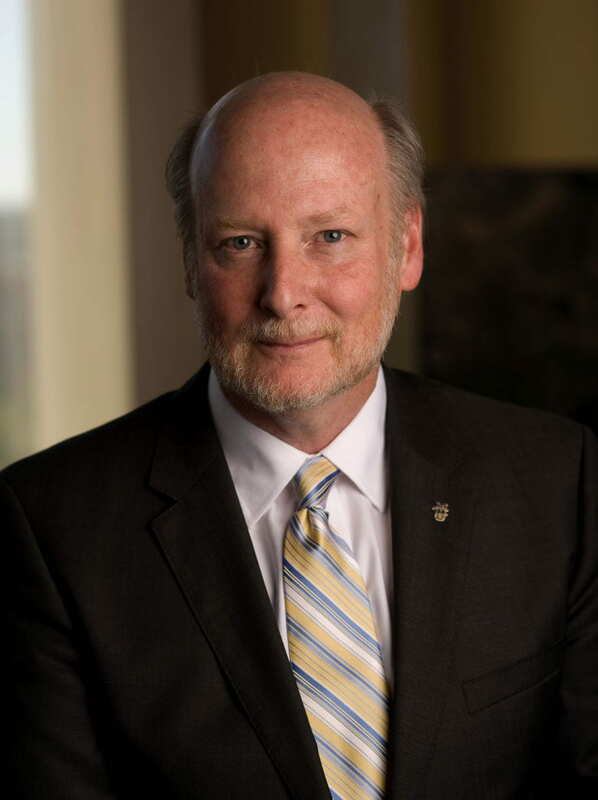 Al Bennett, dean of biological sciences and co-chair of the provost search committee, says Gillman’s willingness to embrace change was among the qualities that made him an exceptional candidate. UC Irvine Chancellor Michael Drake says that Gillman brings noteworthy experience in nearly every aspect of a prominent research university’s mission. Gillman grew up in the San Fernando Valley, the only child of working-class parents. With no siblings in the home, books – particularly literature and poetry – became his companions. Vladimir Nabokov and Leo Tolstoy remain special favorites; in recent months, he’s been reading Alice Munro, Rachel Kushner, John Banville, Karl Ove Knausgaard and Junot Diaz. As he entered his teenage years, the country was embroiled in the evolving Watergate scandal, and it had a big influence on his future development. Gillman credits a high school history professor with igniting his penchant for inquiry and undergraduate courses on the Supreme Court and constitutional law for fanning it. He fell in love with law, not as a practitioner but as a researcher and theorist. The first in his family to attend college, he earned bachelor’s, master’s and doctoral degrees at UCLA. His life’s work and international reputation are built on his exploration of what a liberal arts perspective can bring to questions of law and politics. He’s the author of The Constitution Besieged: The Rise & Demise of Lochner Era Police Powers Jurisprudence (Duke University Press, 1993) and The Votes That Counted: How the Court Decided the 2000 Presidential Election (University of Chicago Press, 2001), as well as dozens of scholarly essays and book chapters. Most recently, Gillman has published (with Mark Graber and Keith Whittington) American Constitutionalism: Volume I: Structures of Government (Oxford University Press, 2012) and American Constitutionalism: Volume II: Rights & Liberties (Oxford University Press, 2012). He and his co-authors are currently working on a six- to eight-volume academic reference work on constitutional history and politics for Oxford University Press. “As a faculty member, I love having the opportunity to identify issues I think are important, to strive to make a distinctive contribution, to move the larger conversation forward,” Gillman says. “That autonomy of mind, the freedom to think and write on my own terms – I highly value that. Early stints as a teenage magician – once performing at the famed Magic Castle – helped him overcome his innate shyness and brought him the satisfaction of producing moments of enchantment for an audience. When, as a graduate student, Gillman first had the opportunity to teach his own classes, he tried to remember the lessons he’d learned as a performer. Gillman has received numerous accolades for teaching and dedication to students, including USC Dornsife’s General Education Teaching Award and USC’s highest honor for career achievement, the Associates Award for Excellence in Teaching, given to only two faculty members each year. In 2001, he was made a Distinguished Faculty Fellow at USC’s Center for Excellence in Teaching. The transition to administration – first as chair of the political science department, then as associate vice provost for research advancement – came at the request of a USC dean. “It was a rare opportunity, after decades doing the same job, to develop as a person and as a professional – to learn new skills, develop new interests, take on new responsibilities and see if I was good at other things,” he says. In 2007, when the deanship of Dornsife College became available, Gillman accepted the job. For five years, he led the largest, oldest and most diverse academic unit at USC. It comprises 33 academic departments, dozens of research centers and institutes, 7,000 undergraduates, 1,200 doctoral students, and nearly 800 faculty members with expertise in the humanities, social sciences, and physical, biological and natural sciences. Gillman developed and managed a budget of about $340 million and oversaw a staff of more than 600. During his deanship, he raised almost $450 million and played a central role in securing a $200 million unrestricted endowment, the largest single gift in the history of USC and the largest naming gift in the history of higher education for a research university’s college of letters, arts and sciences. 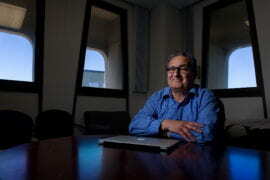 Working with the leadership of the Jesse M. Unruh Institute of Politics, Gillman also oversaw development of the USC Dornsife/Los Angeles Times poll. A demonstration of Gillman’s dedication to the university’s public mission, the poll surveys California voter attitudes on a wide range of political, policy, social and cultural issues. Gillman says he’s already seen examples of UC Irvine connecting with the community. The School of Biological Sciences’ involvement with the Irvine Ranch Conservancy, he notes, shows commitment to the environment and helping people understand it. In return, the protected landscape provides a natural laboratory for biological sciences researchers, which benefits everyone. 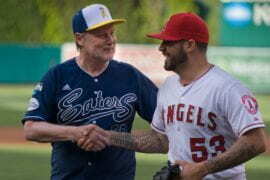 He wants to build on the pioneering spirit of the students and faculty who decided to attend UC Irvine when it was just a field and the community that has grown up around it. He says the campus’s 50th anniversary, in 2015, provides the perfect occasion to celebrate the highlights of the past and the accomplishments of the present – and, most importantly, to set bold new goals for the future.